Valuframe - Notes about using aluminium profile systems. Using Aluminium Profile is not difficult. Valuframe is now a leading aluminium profile supplier and the ease with which systems can be put together, dismantled, altered or members reused elsewhere is one of the main reasons why more and more people favour the use of modular systems over more traditional construction methods. However, Life will be made easier for you if you remember one or two points that you should consider before starting your project. We are happy to discuss your project with you in the early stages as we have the experience to be able to offer advice on the pros and cons of each system for different applications. 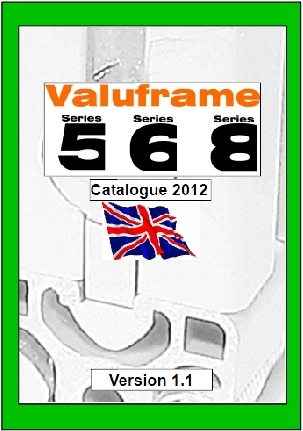 Maybe you should compare your current aluminium profile suppliers with everything that Valuframe has to offer? 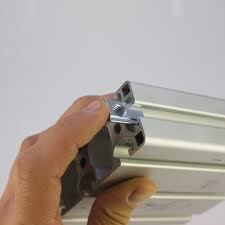 The most important feature of most aluminium profiles is the geometry of the slot. The overall outer dimensions are not generally a feature that makes joining one piece to another easy or difficult , but the slot geometry does if standard joining methods are to be used. There are ways that mixing profile series can be done, but you will find life a whole lot easier if you don’t. 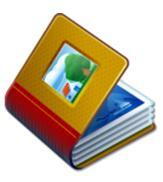 Each profile series tends to have a characteristic dimension that is used in multiples to give various profile sizes. 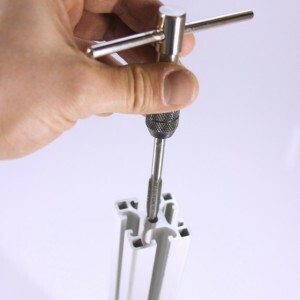 For example series 5 has a 20mm core dimension. Your aluminium profile supplier may offer similar systems, but often the core dimensions are different. So, you might expect there to be 20x20, 40x20,40x40 etc. as typical standard profiles in this series in addition to profiles that have some other shape feature but that still have the 20mm base dimension somewhere to allow it to be neatly joined with other profiles (see previous page for more detail). The slot lies on the centre line of this core dimension, so a 40mm face of a series 5 profile will contain 2 parallel slots lying 10mm and 30mm from one edge. It is easy to see therefore that a 40mm series 8 profile with one slot cannot join neatly to a 40mm series 5 profile which has 2 slots on each side. We believe that we offer more connecting methods at better prices than any other aluminium profile supplier. For the series 8 profiles there are 3 sub categories—standard, light and Eco. Dimensionally the profiles of each sub category are the same but wall and web thicknesses are reduced. 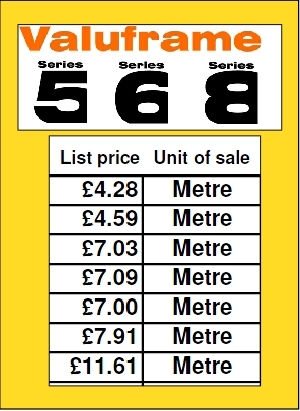 This is reflected in the weight per metre and therefore the strength and the price per metre. 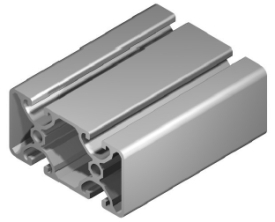 Not all aluminium profile suppliers provide all 3 options. If you have any questions that need an answer don’t hesitate to call us. We are always keen to talk to our customers who want to compare Valuframe with their current aluminium profile suppliers and we regularly come across new applications or unusual ways of using for our versatile product. We’ll be pleased to talk to you about your application and we could save you a lot of time and trouble as we have a broad experience of our market.